This Katie Loxton accessory is great for carrying your girly goodies around in style, with plenty of room for your phone and makeup must-haves for when you're out and about! 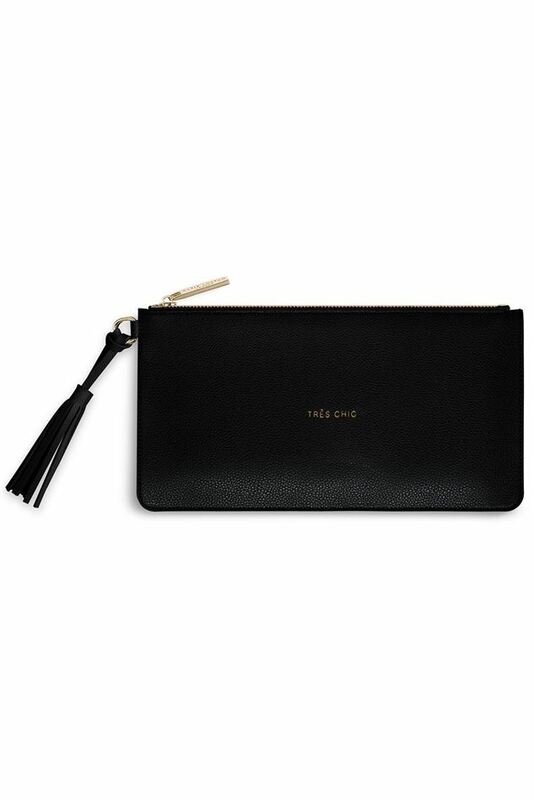 From Katie Loxton's ever-popular florrie tassel pouch collection - cool and classic clutches with golden sentiments and pretty tassel charms - this black coloured clutch bag is slightly longer than Katie's usual perfect pouches. It has a leather-like saffiano surface with a soft matt finish, the sentiment 'Tres Chic' embossed in the middle in Katie's signature golden capitalised text, a stylish tassel charm on the left for effortless chic and is finished with a luxury golden zip fixture, featuring the brand logo. Inside has a smooth finish in the same grey colour and a simple Katie Loxton logo embossed in gold. It's the cutest accessory for carrying your girly goodies around in style, with plenty of room for your phone and makeup must-haves for when you're out and about!